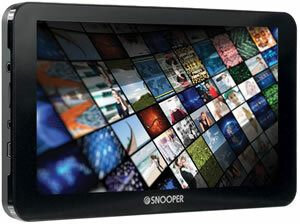 Snooper Truckmate Pro S8100 includes a large 7-inch slim wide touchscreen display and DVB-T2 Freeview Digital TV. 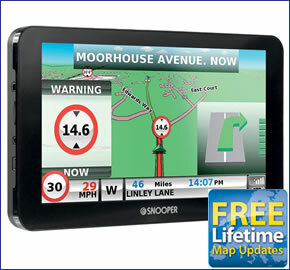 The Snooper S8100 Truckmate Pro is preloaded with maps for Europe. An enhanced, large 3 watt speaker is also built-in to this Snooper satnav device. The S8100 also features Lane Guidance and Junction View to help guide your truck or HGV along your route with turn-by-turn voice directions. Snooper Truckmate S8100 also features Bluetooth for handsfree calls and provides FREE TMC Traffic information and speed camera locations by subscription. My Speed feature displays road speed limits for every road whether there is a speed camera present or not. Snooper S8100 Truckmate Pro Europe has been discontinued. Accessories and spares for the Snooper S8100 Pro can be purchased here. Snooper Truckmate Pro S8100 is a portable premium 7-inch satellite navigation system which has been designed for drivers of trucks, HGVs and other commercial vehicles. ‣Snooper S8110 Ventura - for drivers towing caravans or driving a motorhome, or large camper vans. 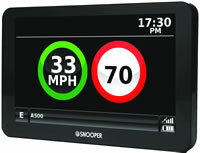 Please note:The above Snooper S8100 model also features a car mode. The Snooper S8100 replaces the older S8000 model. The difference is the new S8100 has a better 3 Watt integrated speaker and also a better DVB-T2 TV built in. The Snooper S8100 truckmate sat nav features a large 7-inch touchscreen and includes Bluetooth, DVB-T2 Digital TV and built-in FM transmitter. A large 3 watt speaker is also integrated into the Snooper S8100 sat nav. With this system you can watch Freeview TV in your vehicles cab. The Truckmate S8100 uses the latest here mapping and is available preloaded with UK and European maps. S8100 truck sat nav also provides advanced warnings to roadwork's, congestion and traffic jams and what's more these alerts are all FREE. The S8100 features TMC Traffic information which utilises the traffic master information network. SPECIAL OFFER: Buy the S8100 Truckmate Pro or any other Snooper truck sat nav model from ActiveGPS and receive FREE lifetime map updates worth over £100. The annual road map updates are by here. Details of the offer and other models that include the FREE lifetime map updates are available via the following link. The Truckmate 8100 works like a normal sat nav; you enter the address, postcode etc, for turn-by-turn directions to your destination. What makes it very different is that you can enter and save your trucks load, height, weight, width, length and the Snooper truck mate's preloaded software will then calculate the best route avoiding low bridges, unsuitable and too narrow roads, etc. Snooper S8100 Truckmate Pro Sound truck sat nav is the result of more than 5 years of development of the Snooper truck mate range. Research has shown that truckmate users will save money over time. By using Snooper satellite navigation to find the shortest or most economical route you will save 16% fewer miles driven on each journey and thus also a 16% saving in fuel expenses making this Snooper Truckmate pay for itself. 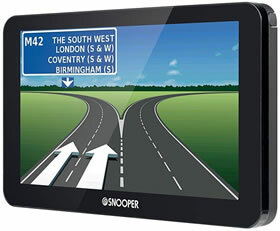 Snooper Truckmate S8100 Pro lorry sat nav on-board features include Junction View and Lane Guidance. These features make it clear what lane you need to be in at each junction providing you with plenty of warning. To make your current location clearer and to highlight where you are heading this truck sat nav can also increase the size of road names and numbers displayed on the 7-inch screen. The Snooper Truckmate S8100 has a point of interest 'corridor' search which will inform you of points of interest along your predetermined route. Additionally the S8100 sat nav system includes AdBlue Filling Station Points of Interest. This feature allows you to find your nearest petrol station. There is also a route timer that can be set to alert you when it is time to take a break on your journey. There is a car mode in the Truckmate S8100 so the system can be used in a car on its own instead. Truckmate S8100 includes as standard My Speed information meaning it will tell you the speed limit of every road regardless of whether there is a speed camera there or not. You can get speed limits for lorries over 3.5t. The Truckmate S8100 will also alert you if you exceed the speed limit protecting your driving licence. The Snooper S8100 Truckmate can also be optionally updated to include Snoopers’ Aura Database of speed camera locations. Click here to read more about the AURA speed trap database. Snooper S8100 Truckmate Pro mounts on the inside of your vehicles windscreen using the suction cup windscreen bracket provided. Snooper S8100 Truckmate Pro can be powered directly either from its internal battery if it's fully charged or powered from the cigarette lighter socket. Snooper S8100 Truckmate Pro provides advanced warning of all fixed speed cameras, SPECS and many laser sites using Snooper's AURA speed trap database. There are 3 easy ways to pay using a credit or debit card. The Snooper S8100 will only operate on Windows computers. Specifically, you must be using Windows 7, Windows 8, Window 8.1 or Windows 10. Additionally the software will only work with Internet Explorer 6 or Netscape Navigator 6 or above. Please note: The Snooper S8100 is not compatible with and will not operate when using earlier Windows or Apple Macintosh operating systems. The S8100 Truckmate Pro comes supplied with everything you need to use it in-car (see What's in the box? above), however replacement and additional S8100 accessories are also available to buy from ActiveGPS. Extra parts that you might like to consider buying include: hardwire power cable and a soft carry case. Do you have a question about the Snooper S8100 Truckmate? Submit your question via our contact page.